Looking for the perfect holiday dessert? 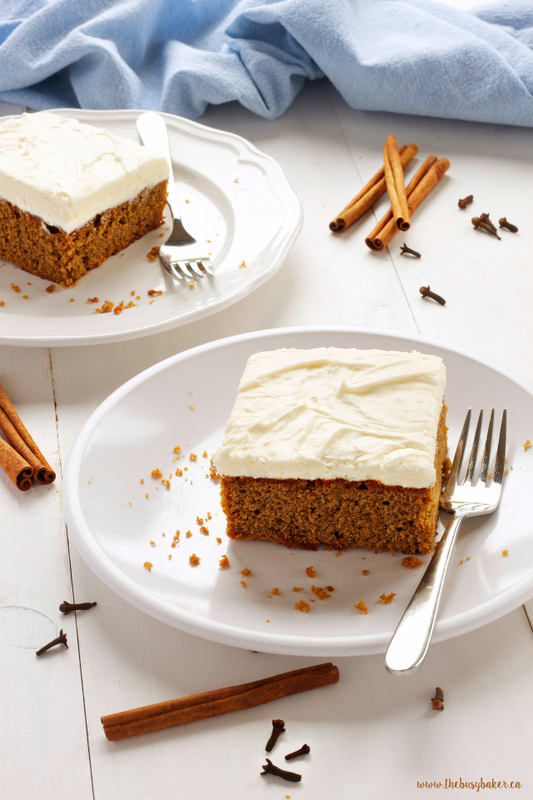 This Gingerbread Spice Cake with Fluffy Cream Cheese Frosting is what holiday dreams are made of! 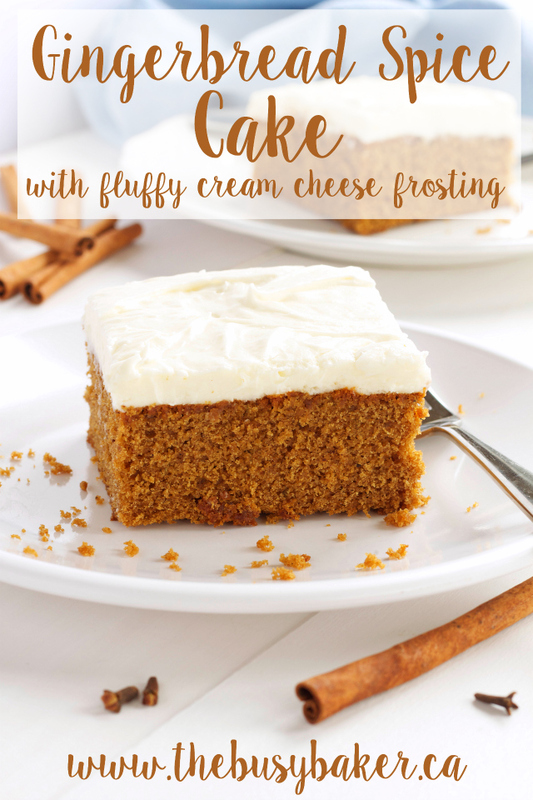 It’s a deliciously tender cake bursting with holiday flavours like fresh ginger and aromatic spices and topped with the fluffiest cream cheese frosting ever! It’s the perfect holiday cake and makes a great winter dessert for any occasion! Looking for more delicious holiday recipes? 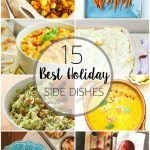 CLICK HERE for my favourite holiday recipes, all in one place! Can you believe the holidays are almost upon us?? I feel like I went to bed last night and it was August and woke up this morning to a blanket of snow on the ground and crisp November air. 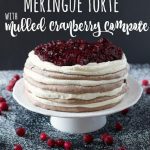 Not that I’m complaining…I absolutely love this cooler weather and I adore the holiday season for so many reasons, including all the delicious holiday recipes I get to whip up! And if gingerbread isn’t an excuse to get busy in the kitchen, I don’t know what is! There are so many delicious holiday desserts, from cheesecakes to cakes to cookies and truffles…the list goes on forever, but one of the most underrated holiday dessert flavours is anything gingerbread. You guys know how much I love gingerbread, and my Ginger Molasses Cookies that I shared with you this time last year have been a HUGE hit on Pinterest and Facebook. 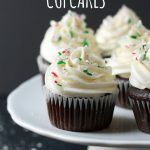 Seriously, they almost broke my blog… And of course, flavours like chocolate and mint and pumpkin definitely have their place during the holidays but in my humble opinion, gingerbread is where it’s at! It’s quintessentially Christmas-y and there’s really no other time of the year when you can enjoy it in the same way as during the holiday season. 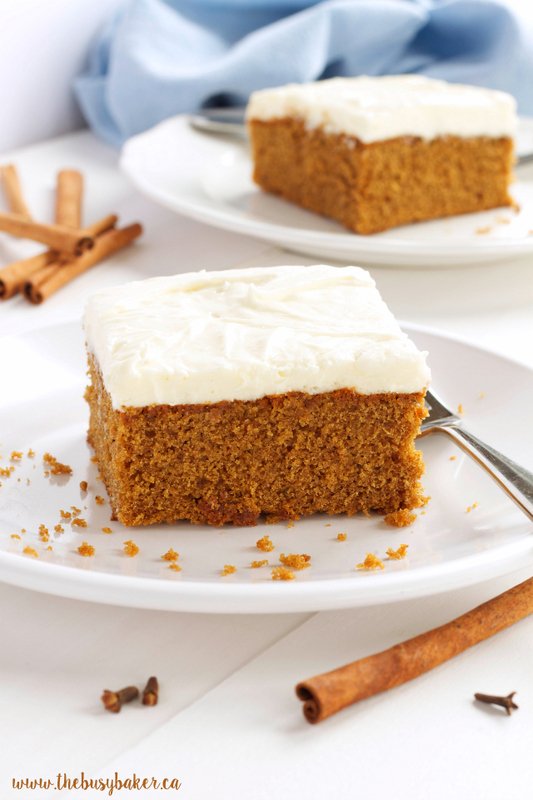 I’ve been making this Gingerbread Spice Cake with Fluffy Cream Cheese Frosting recipe for years. 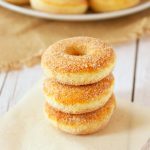 I originally came across this recipe from Chef Anna Olson and I’m SO glad I stumbled across it one day! 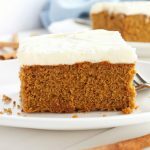 It always turns out SO well – moist and dense, but at the same time it’s so tender and just a little bit fluffy, so topping it with a deliciously creamy frosting is definitely the way to go. And what’s even better is that you don’t have to fuss with making a layer cake – this recipe is perfect for a simple rectangular baking pan and serving it sheet cake-style works beautifully. 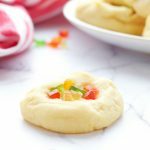 Trust me, you’re definitely going to want to add this one to your holiday baking list this year! 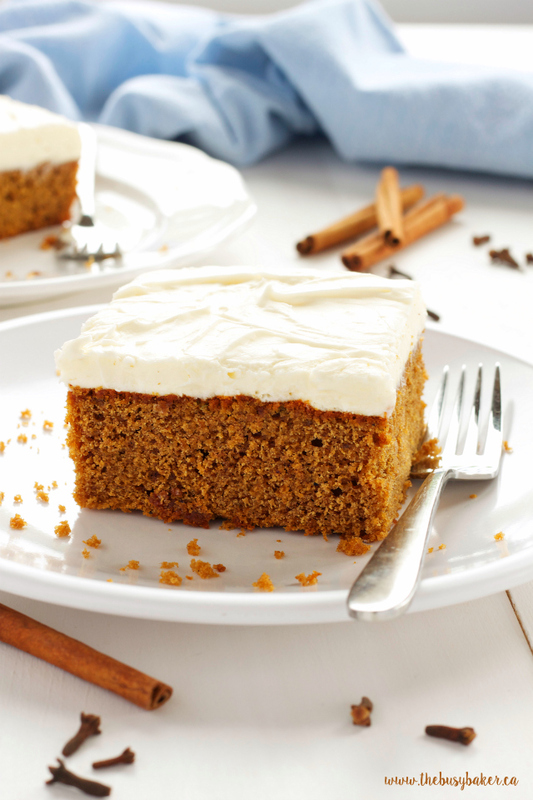 This Gingerbread Spice Cake with Fluffy Cream Cheese Frosting is so delicious and tender and the frosting is perfectly pillow-y and soft – it’s the perfect combination and makes an irresistible holiday dessert that everyone will love! 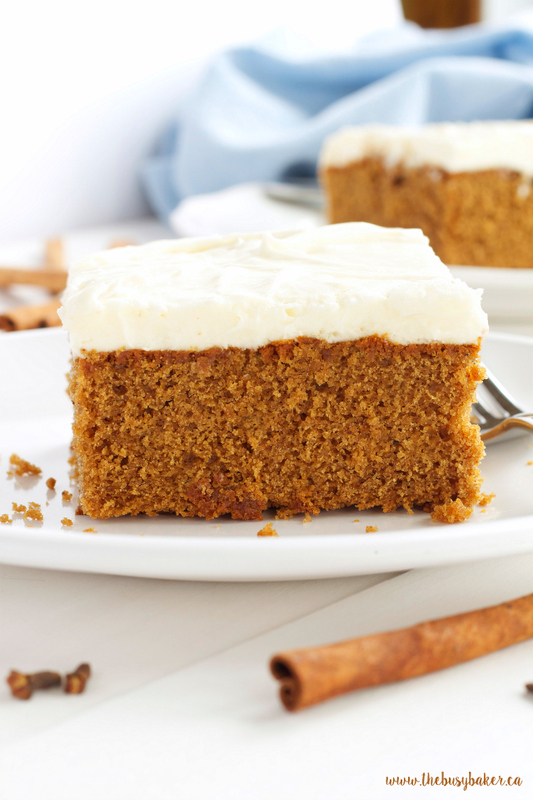 I hope you enjoy this Gingerbread Spice Cake with Fluffy Cream Cheese Frosting recipe! Let me know in the comments below, what’s your favourite way to enjoy Gingerbread during the holiday season? Love what you see here? Check out the other holiday recipes I have linked below! They’re some of my favourites!! 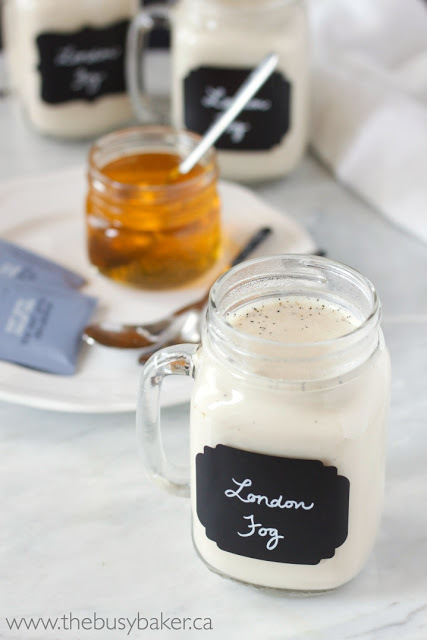 I love curling up on a cold day with my delicious homemade Earl Grey Tea Latte (London Fog). It’s a healthy homemade recipe that will have you staying home from the coffee shop! 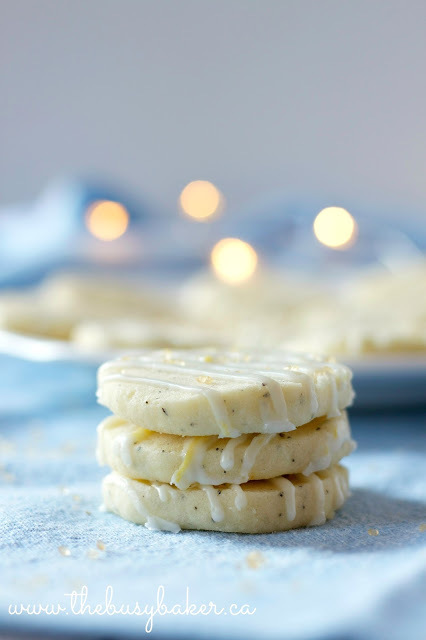 These Earl Grey Shortbread Cookies with Lemon Glaze make a deliciously edible gift for the tea-lover in your life! 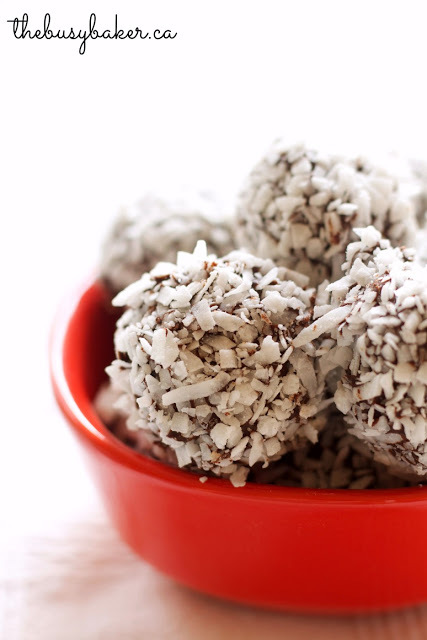 These Peppermint Chocolate Snowball Truffles are SO delicious and feature a secret ingredient that makes them extra special (and easy to make!!). 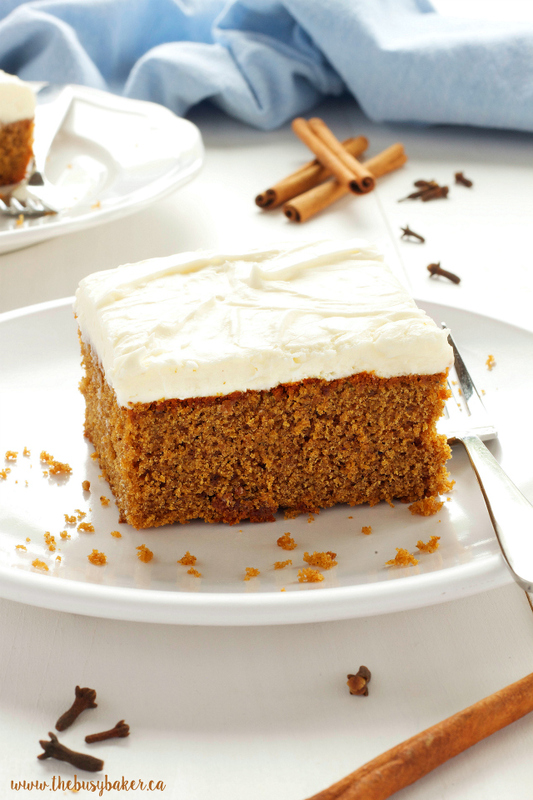 This Gingerbread Spice Cake with Fluffy Cream Cheese Frosting is the perfect cake for the holiday season made with fresh ginger! Preheat your oven to 350 degrees Fahrenheit and grease a rectangular baking pan with butter (I use a 9" by 13" pan). Using a stand mixer or hand mixer, beat the butter and brown sugar on high speed until light and fluffy. Beat in the molasses until combined and then add the eggs one at a time and beat them in on medium-low speed just until incorporated (scrape down the sides of the bowl to make sure everything is combined). Add the grated ginger and lemon juice and beat on low speed until combined. Add the flour, cinnamon, cloves, nutmeg, allspice and salt to a separate bowl and whisk until combined. Add the dry ingredients to the butter mixture slowly, beating on low speed just until no streaks of flour remain. Combine the boiling water and baking soda in a small bowl and add it to the batter slowly, stirring it in just until combined. Scrape the batter into the prepared cake pan and bake at 350 degrees Fahrenheit for about 45-48 minutes or until a toothpick inserted into the centre of the cake comes out clean. Set the cake to cool in the pan on a wire rack until it's cooled completely. While you're waiting for the cake to cool, make the frosting by whipping together the butter and cream cheese on high speed until light and fluffy. Add the powdered sugar slowly, about half a cup at a time and whip on high speed until it's all incorporated. At this time, add the milk (only if the frosting is stifa few drops at a time as it continue to whip on high speed. Stop adding as soon as the frosting has loosened up just a little bit and whip the frosting on high speed for 5-10 minutes, or until the frosting is very light and airy in texture. Spread the frosting over the cake, only after the cake has cooled completely to room temperature. If you wish, refrigerate the cake for an hour or two for the frosting to set and let it sit at room temperature again for 15-20 minutes before cutting into it to serve. Cut into square slices and serve!